This entry was posted in Book Review, craft-based annotation, dark fiction, MFA Writing, writing craft, writing style. Bookmark the permalink. David,I can’t tell you how glad I am that you read and enjoyed this collection! As your summary does a great job of illuminating, Saunders is a flat-out brilliant writer and satirist. I would go so far as to say he is a literary genius of the first rank. To me, he seems uniquely capable of combining hilarious, laugh out loud comedy with a deeply tragic sense of the sordid shadow side of our can-do, materialist, relentlessly optimistic twenty-first century culture. 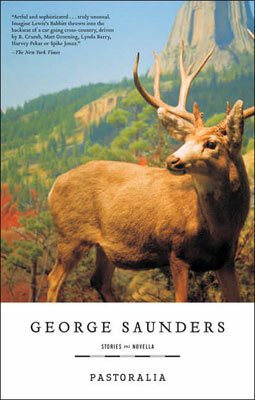 Plus, his stories are just so much fun to read.Your point about the mechanics of Saunders’ first-person narration – the sense of “stumbling through his thoughts” – is very well taken. It allows him to reveal quite a bit about his character – things that are funny, but funny in such a way that it kind of hurts to laugh. The same thing is true of the corporate memo in Pastoralia – only in this case the unguarded stream-of-consciousness narration is revealing not of one character but of an entire corporate culture – and I think you’re absolutely right to draw a parallel between them. It was also fascinating for me to read that this kind of language rings true in your experience as a corporate writer. I can’t say I’m surprised, but I’m very glad you thought to point that out. It is its relationship to Truth, after all, that makes the best satire so powerful. I think you’ve really put your finger on an important craft element in Saunders’ work, one that I hadn’t really seen: the fact that he uses his POV characters’ “limited perception” to reveal aspects of their culture and personal makeup that they themselves aren’t aware of. The reader knows more than the characters, in other words, and this creates an ironic distance that is essential for the appreciation of the comedy, as well as the tragedy, he’s aiming to get across. That’s a great insight.As is your main take home lesson: it is Saunders’ violations of the conventions of sentence structure allow him to create the conditions we’ve been discussing. In other words, his grammatical transgressions are an important aspect to his resounding success as a storyteller. Well done!